The world of property investments opens its doors to buyers looking for options with great returns and calculated risks. However, most of them are confused about deciding between a residential and commercial real estate investment. While there is no one choice that fits everyone’s needs, it is important to weigh the pros and cons of both the options and settle for the one that maximizes return on investment. Apartment buildings, individual houses, housing complexes, condominiums, co-operative units, etc come under residential real estate investments. It is usually purchased by individuals to satisfy the needs of their families or to become landlords & house flippers. All kinds of non-residential buildings, intended solely for business purposes, like offices, factories, industrial units, retail complexes, medical centers, hotels, malls, retail stores, warehouses and garages etc. would be classified as commercial real estate. Buying a commercial property requires higher capital upfront (a minimum of 30%), while for a residential property, one can borrow 80 to 100 per cent of the purchase price depending on the individual’s income and credit history. Securing loans from banks and financial institutions for residential real estate is much easier and requires lesser paperwork and documentation than for commercial property. 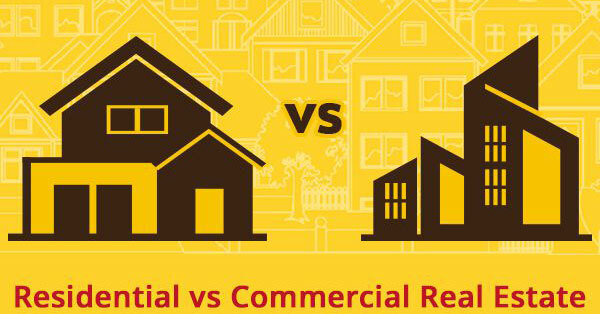 Moreover, interest rates tend to be higher for commercial real estate loans as compared to residential real estate. In case of commercial real estate, tax benefits are almost non-existent while it’s not the case when it comes to residential mortgages. Home loans earn the borrower a tax deduction on the interest component for up to Rs. 2 lakhs and on the principal amount for up to Rs. 1.5 lakhs, thereby resulting in a considerable tax saving. There is a growing demand for rented housing, especially in Indian cities. This keeps the demand for housing high which fuels capital appreciation and also ensures that finding a tenant is not a very difficult task. In comparison, finding a suitable tenant for commercial property is a fairly time consuming process and could result in a loss of income for a considerable period. A commercial property’s location plays a major role in deciding the success of that investment. However, a residential property that offers adequate social infrastructure and transport facilities normally attracts a good amount of buyer interest. Commercial real estate is said to be more volatile and less predictable than residential real estate and may not suit the investment appetite for most investors, especially those who are averse to volatile investments. Commercial property lenders are strict when it comes to property dealings and any delay in this process can incur Goods and Services Tax (GST) charges. However, these charges are not applicable when it comes to residential properties. Choosing the right real estate investment strategy to secure as well as earn returns on your investment lies in understanding the nuances of buying & managing these properties. There are two sides to any investment vehicle and an informed decision is made only when the options are weighed based on each individual’s requirements and resources. Especially for first time investors and individuals with low risk appetite expecting steady returns, it is always recommended to invest in residential sector before stepping into the commercial world. If you’re looking for residential real estate investment options projects in Chennai, Bangalore and Coimbatore. Each of our apartments & villas are landmark projects with world class amenities & situated in ideal locations with the best social infrastructure. Apart from fulfilling your entire dream home needs, our properties also promise great capital appreciation and return on investment.